Image: Mark Von Holden for SheKnows. Denise Woodard enjoys a healthy, active and on-the-go lifestyle. Her fast-paced daily routine often means grabbing some healthy premade snacks as she runs out the door. When her daughter, Vivienne, started eating solid foods, that all changed. Vivienne is now 3 years old, but when she first started eating solid foods, it became clear that she had several food allergies. The on-the-go lifestyle Woodard and her family had become accustomed to came to a screeching halt because Woodard could no longer run into a grocery store, grab some snacks off the store shelves for Vivienne and hit the road. Instead, she left the stores feeling frustrated that there were no safe and healthy options available for her family. "It was so frustrating because when I would find one of the few things she could eat, she either did not like the taste or I was not happy with the nutritional profile," Woodard tells SheKnows. But from that frustration, a business idea was born. "I was literally in my living room in June 2016, talking to our nanny, and she was asking 'Why doesn't Vivienne ever eat anything fun? ', and I reiterated the dilemma I was faced with at the store and I just didn't have the time/energy to continuously make fun snacks from scratch, and she asked, 'Why don't you just start a company?'" That's when Partake Foods was born. "We went on to win a pitch competition — The Start Something Challenge — a few weeks later just based on our idea, and that gave me the confidence to turn my idea into a reality," Woodard says. That wasn't the only competition Woodard has won. Woodard and Partake Foods recently won The Pitch competition at SheKnows Media's #BlogHer18 Creators Summit in New York. 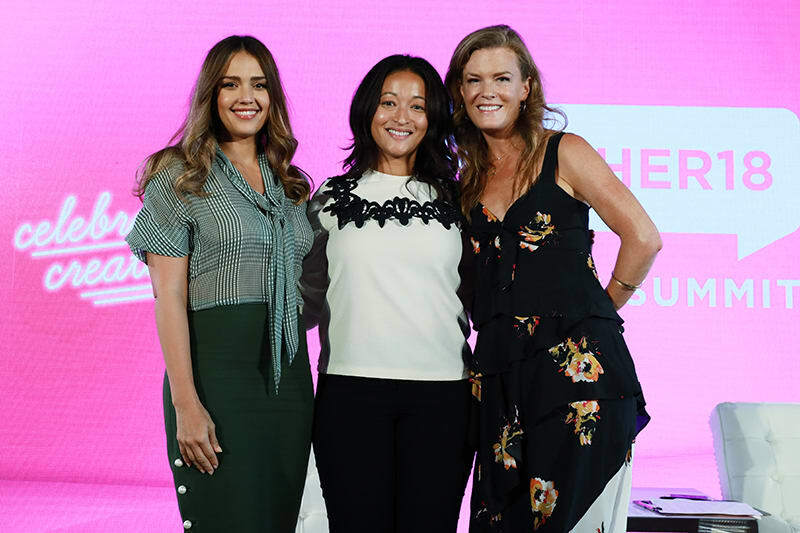 The Pitch spotlights up-and-coming female visionaries, giving them the chance to explain their business ideas to a panel of judges. After a hardball Q&A session, the audience votes, and the winner takes home a prize of $50,000 and a dinner with business mentors. 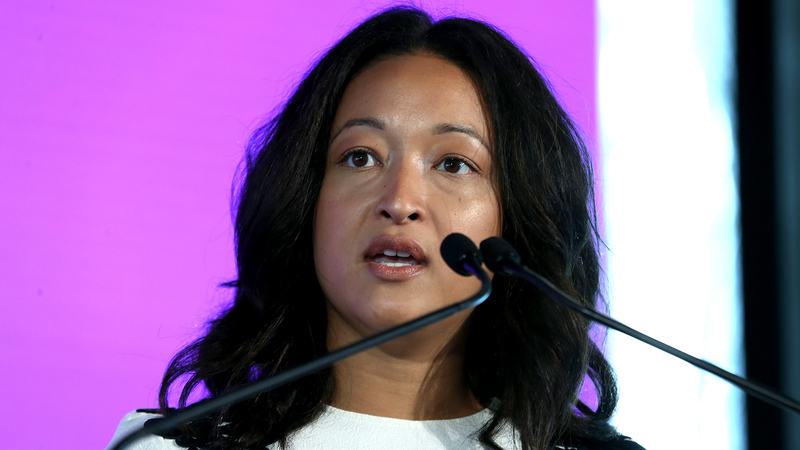 Woodard pitched her company to the audience, and later that afternoon, Jessica Alba and SheKnows Media CEO Samantha Skey announced that Woodard was the winner of the grand prize. Partake Foods currently produces three flavors of mini-cookies that are free of the top eight most common food allergens. They are vegan, gluten-free and delicious, but developing recipes that are safe, healthy and taste good wasn't an easy process. "I knew I wanted a product that was made with whole or ancient grain flours, included fruits/veggies and had less sugar than existing options, so it was quite difficult," Woodard tells SheKnows. "I initially worked on the formulas myself, but we ended up bringing in a food scientist, who also has food allergies, and we got really creative using dried plum concentrate to help sweeten, rosemary extract as a natural preservative and figuring out how to get those fruits and veggies in," Woodard says. Partake Foods is now available at Amazon, Wegmans and a bunch of health food stores across the country — a pretty impressive feat. But like most female entrepreneurs, Woodard quickly learned that starting a company is much more difficult for women than men. "I thought that with my background — I worked in venturing and emerging brands at Coca-Cola, building and selling entrepreneurial brands and am a food allergy mom — starting a company focused on allergy-friendly products, our team and traction, we would be an 'easy' sell, but I can't count how many times I've been asked questions like, 'Well, who will take care of your daughter if you're busy with this?' Woodard tells SheKnows. "Luckily, I haven't let this deter me," she continues. "It's forced us to grow a financially stable, sustainable business, which I'm proud of." As for the future of Partake Foods? Woodard has big plans. "We're working diligently to grow distribution of our existing products, but my bigger brand vision is that we will innovate across multiple categories, providing meal or snack options for every part of the day that are delicious, nutritious and allergy-friendly. Our mission is to provide peace of mind to those with dietary restrictions and simple enjoyment to those without, and my hope is that Partake Foods becomes synonymous with bringing people together through yummy, healthy meals and snacks that everyone can enjoy."